Serenity abounds on this smooth and scenic span of sand. The easy-to-navigate route and smooth terrain invite a state of calm meditation. Keep an eye out for bald eagles and sea shells, especially in the early miles. 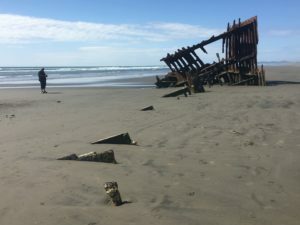 This lovely beach walk concludes at the shipwreck of the Peter Iredale in Fort Stevens State Park. Only three miles farther is the south jetty of the Columbia River, and the finish line for northbound hikers on the Oregon Coast Trail. I highly recommend combining these two hikes if possible! Read about the hike from the Peter Iredale to the south jetty. This nine-mile hike is also a worthy goal in itself, and could be accomplished with a car shuttle or by utilizing transit. Alternatively, you could do a grueling 18-mile out-and-back. The format of your hike doesn’t matter so much as getting out there and enjoying this stunning north coast scenery! Check the Tides: Although this route is by no means impassable during high tide, it is preferable to go during low tide. 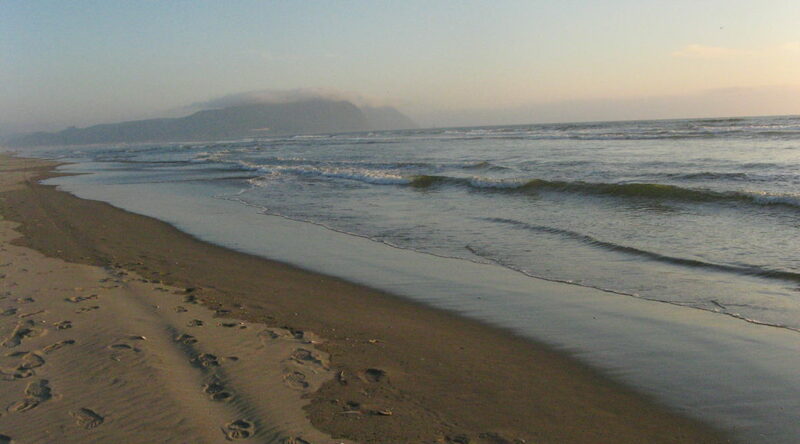 At low tide, the footing is better, because there is more firm, wet sand exposed. Tons of shells will be exposed at low tide. Also, when the tide is out, you can actually walk up to the Peter Iredale! Check the tides here. A full day of beautiful scenery awaits. Embark from the beach access road at the end of 10th Street in Gearhart. You will head north from here; the ocean will be on your left. The walk begins in an area that is often overrun by cars, but the amount of vehicles will diminish briefly after about 0.5 miles. Keep an eye out for sand dollars during low tide in this area, and watch for bald eagles soaring overhead. 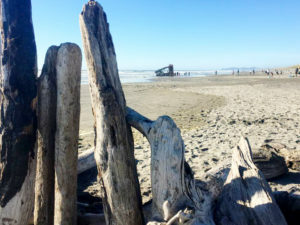 As you approach the Del Rey State Recreation Site access road (about 1 mile from Gearhart), the amount of cars and beach-goers will increase again. Keep an eye out in this area; in my experience, drivers and motorcyclists here tend to be reckless and inconsiderate. Thankfully, once you are past Del Rey, you will enjoy relative solitude for about 3.5 miles. Soak in the quiet expanse of sand and sea as you continue along the level beach. Keep an eye out for sea shells and wildlife in this span. During the summer, elk come down from the mountains to calve in the dunes. Give them a wide berth if you see them, but certainly snap some photos and soak in the views of these majestic creatures. 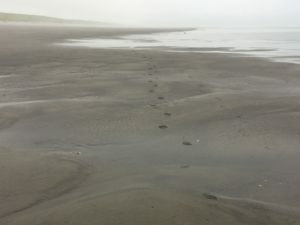 About 4.5 miles from Gearhart, you will pass another beach access point, this time at Sunset Beach. This area tends to be less busy than Del Rey, but you will likely still see an uptick in cars and people in this area. Soon, however, you will seemingly leave civilization behind as you commence another long stretch of secluded beach. Here, you have the Oregon National Guard to thank for your solitude: You are walking parallel to Camp Rilea, which limits public access to the coast in this span. NOTE: The coast itself is public, as per the 1967 Beach Bill, so you don’t have to worry about trespassing or anything! About 4.5 serenely quiet miles past Sunset Beach, you will arrive at the picturesque shipwreck of the Peter Iredale. Ideally, you should plan to arrive at low to mid-tide so that you can walk out to the wreck, but it is visible, and highly photogenic, at any time. Allow plenty of time to enjoy this lovely area before you move on. 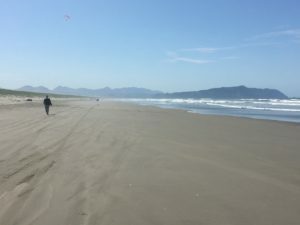 Next, you can either get a ride back to Gearhart, turn south to complete an 18-miler, or press onward to the south jetty of the Columbia River and the finish of the Oregon Coast Trail. When I completed my northbound trek on the OCT, I went from Gearhart to the south jetty in one day (12 miles). This was completely do-able, and made for a pleasant final day on the trail. I would recommend following suit. Jump ahead to the hike from the Peter Iredale to the South Jetty Observation Tower. Save the Planet! Strategize transit on the OCT Transportation page. Next up: Shipwreck of the Peter Iredale to South Jetty Observation Tower, Fort Stevens State Park. Backtrack: Gearhart Beach Access (Pacific Way) to the Next Gearhart Beach Access (10th Street). Return to OCT North Coast Trail Data. Return to the Oregon Coast Trail main page. Find more Trails & Travels!